The Cutty Sark along with the National Maritime Museum, the Queen's House and the Royal Observatory, all of which are discussed below, are part of the Royal Museums Greenwich. With a few exceptions, these attractions are open every day. See the RMG website for opening hours. 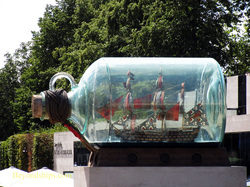 HMS Victory in a bottle. Walking up from the river past the Old Royal Naval College, you come to Romney Road. On the other side of that road is an iron fence with a gate indicating the entrance to the National Maritime Museum. The National Maritime Museum is the largest maritime museum in the world. Its collection contains some 2.8 million items. Two million people visit the museum each year making it one of the most popular attractions in Great Britain. 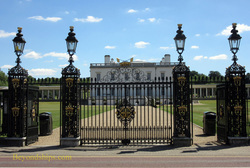 Ever since it was created by Act of Parliament in 1934, the home of the National Maritime Museum has been the Queen's House and its related buildings in Greenwich. The entrance that you see approaching from the river is the Southwest Wing, which was added to the Queen's House in the Victorian era. In 2011, this area was expanded and enhanced by the addition of the Sammy Ofer Wing, a largely underground structure, which also provides a main entrance on the opposite (Observatory Hill) side of the Museum. Inside, the Museum presents a vast modern exhibition area. The collection is too vast to be displayed all at once. Therefore, in addition to several permanent exhibits, the Museum hosts a series of temporary exhibits. 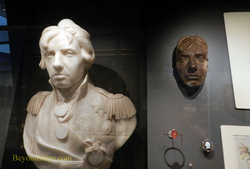 A bust and life mask of Lord Nelson. The exhibits include boats and other watercraft, historical artifacts and interactive displays. One of the permanent galleries is devoted to Britain's greatest naval hero, Admiral Lord Nelson, whose victory over the combined French and Spanish fleets at Trafalgar in 1805 ensured British dominance of the seas for more than a century. The exhibits include the uniform Nelson was wearing when he was killed. More importantly, the gallery puts his life in context, showing the role of the Royal Navy in that period as well as Nelson as a person. In addition to the exhibit areas, the Museum houses an extensive library including 100,000 books and two-miles of shelved manuscripts. With the new Sammy Ofer Wing, access to these resources has been made easier with facilities for public access and areas for scholarly study. 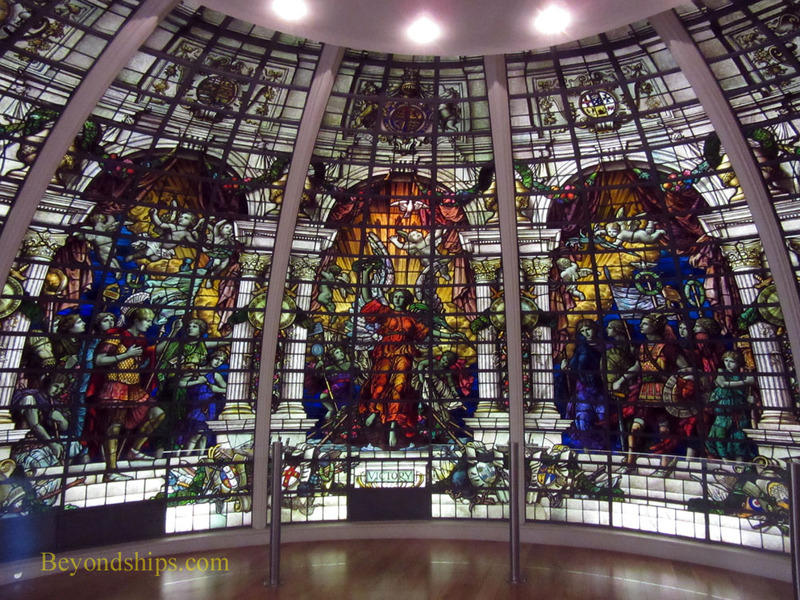 John D. Forstyh's stained glass from the Baltic Exchange. The Queen's House is the focal point of the Greenwich maritime complex whether you look from the Thames or from Observatory Hill. It is also one of the most architecturally important buildings in Britain. Begun in 1616, the Queen's House was designed by Inigo Jones and was the first truly classical building in Great Britain. Jones employed concepts and proportions derived from ancient Greek and Roman buildings to produce a building that was revolutionary for its time. The Queen's House was an addition to the old Palace of Greenwich, a group of red-brick Tudor buildings now gone. It was originally intended for the use of Queen Anne of Denmark, the consort of King James I and when she died work stopped on the house. It re-commenced in the next reign for Queen Henrietta Maria, wife of King Charles I. Reflecting that court's style, the interior was elaborately decorated with paintings and sculpture. But after its completion in 1638, the house was only used as a royal residence for four years before the English Civil War erupted, leading to Charles' execution and the abolition of the monarchy. Following the restoration of the monarchy in 1660, the Queen's House became a “grace and favor” residence. The monarch would allow members of the royal family or other people that he or she wanted to patronize to live in or use the building. For example, under King Charles II, the artist Willem van de Veldes and his son were allocated the Queen's House. 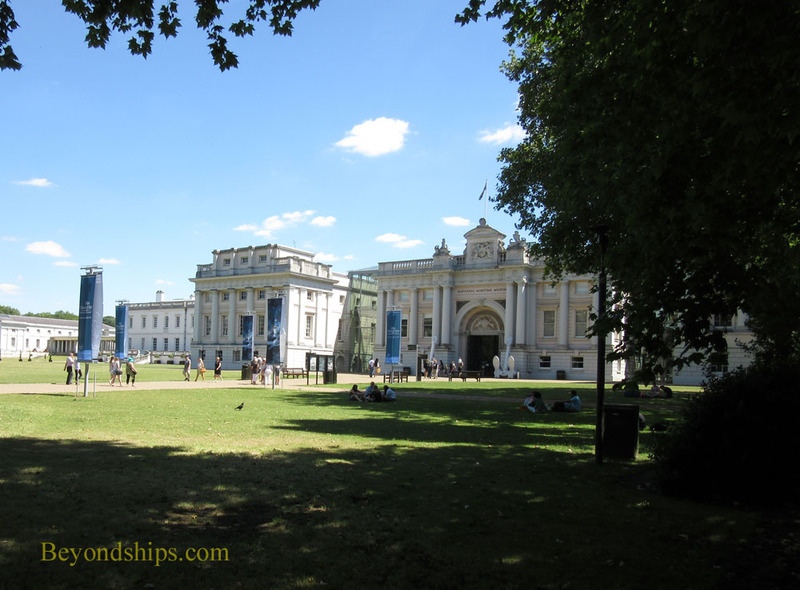 In 1806, the Queen's House became the Royal Hospital School for the orphan children of seafarers. In order to provide dormitory and classroom space for the children, wings connected by colonnades were added on either side of the house. 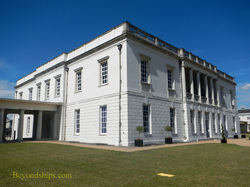 The school moved in 1933 and by Act of Parliament the next year, the Queen's House and its wings became the home of the National Maritime Museum. Today, it is used primarily to display works from the Museum's collection of fine art. The collection is a specialized one, brought together because of the subject matter of the works rather than because of the artists or the artistic style. 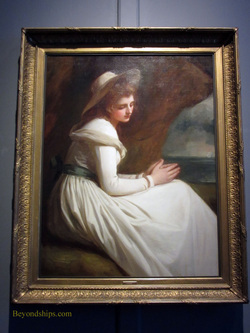 Nonetheless, included in the collection are works by British masters such as Reynolds, Gainsborough, Romney, and Hogarth. Its gallery rooms are not as crowded as those in the great museums of central London. Thus, you can stroll without disturbance and contemplate the people and scenes portrayed. In addition to the art work, the interior of the Queen's House itself has several noteworthy features. The Great Hall at the center of the Queen's House is an impressive room. It is a perfect cube, reflecting the 17th century's interest in harmonious mathematical proportion. The floor is laid out in a black and white pattern while its ceiling was designed to incorporate elaborate paintings. Over the years, the paintings that once decorated the Great Hall have been moved elsewhere. However, you can get an idea of how the house was originally decorated from the painted ceiling in the Queen's Bed Chamber. The Tulip Staircase was the first centrally-supported geometric stairway in Britain. Each stair is cantilevered out from the wall but also obtains support from the stair beneath it. Leaving aside its construction, the staircase is visually interesting. Standing at the base and looking up, the stairs seem to spiral like the inside of a sea shell. Also, the staircase is said to be haunted. In fact, in 1966, a tourist took a photograph that when developed appeared to show three spirits ascending the stairs. There have been other sightings of ghosts elsewhere in the Queen's House.